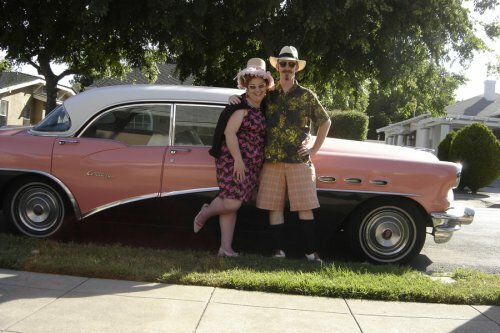 I wanted to send some pix of me and hubby, representin' for fat coupledom ( well, at least I am representin' for the fat side).&bsp; But I wanted to add that we got married ( first timers, both!) at 40, and pretty much have a blast together every day.&bsp; Hubby is an artist who paints a lot of fat nudes in interesting retro and sci-fi settings.&bsp; Rarely does anyone 'get' them, but he enjoys putting his vision out there.&bsp; As for me, I put on the monkey suit and represent in corporate marketing, so feel glad to have an outlet for freaky fashion. [Explanation for this amazing picture:] A friend had a 6/6/06 party with a hell theme.&bsp; So we went as the "Neighbors from Hell"...we insisted on showing embarassing family photos, reading bad poetry out loud,&bsp; etc.